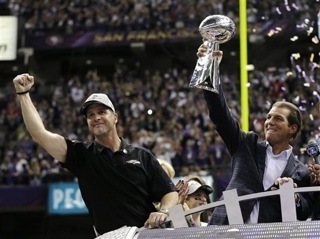 Joe Flacco, Ray Lewis and the Baltimore Ravens sit atop the football world as Super Bowl XLVII champions. 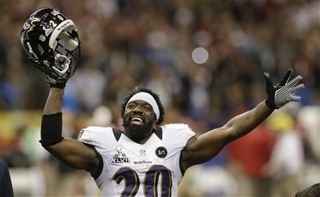 The Ravens held on for a 34-31 victory. The Ravens jumped all over the 49ers early, leading 28-6 after Jacoby Jones took the opening kickoff of the third quarter 108 yards for a touchdown. Then the lights when, literally in the Super Dome. Following the 34 minute delay, the 49ers came alive and got as close as 31-29. The Ravens defense mustered up a final goal line stance to seal the deal. 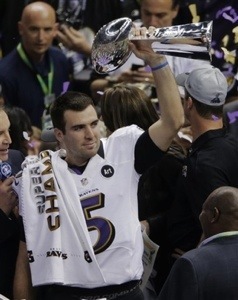 Joe Flacco was named Super Bowl XLVII MVP. Flacco passed for 287 yards and 3 touchdowns. Flacco has now elevated himself into the discussion of one of the elites. Anquan Boldin caught 6 passes for 104 yards and a touchdown. Jacoby Jones not only had the kick return touchdown but also an amazing 59-yard touchdown reception. 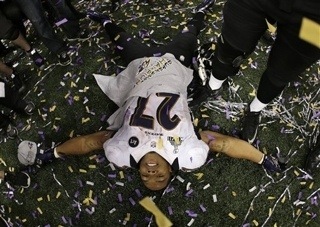 Last but not least, Ray Lewis ends his career on top, a champion. Young Colin Kaepernick did not disappoint in his Super Bowl debut. Kaepernick passed for 302 yards, 1 touchdown and 1 interception. He also ran for 62 yards and a touchdown. Frank Gore rushed for 110 yards and a touchdown. 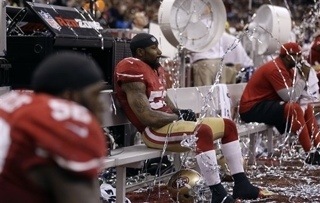 Michael Crabtree caught 5 balls for 109 yards and a touchdown.